New locations, missions and new sniper maps are coming to Hitman 2. 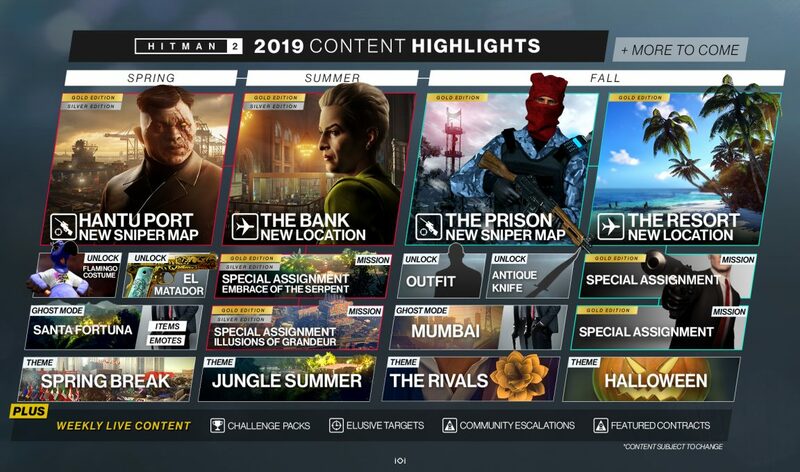 Io Interactive has updated the Hitman 2 roadmap, outlining some of the content coming to the game this spring and into fall. You can also expect new Ghost Mode locations, unlocks, and a wealth of other new content. This spring, the new Sniper Map Hantu Port is coming to the Expansion Pass and Gold Edition. You will also be able to unlock the Flamingo Suit, participate in the Santa Fortuna Ghost Mode and enjoy the new Spring Break theme. If you didn’t unlock the El Matador pistol in March, looks like you’ll have another chance at it soon. Come summer, Agent 47 will visit The Bank before heading to a prison and resort this fall. Each new location will bring new targets, challenges and mastery unlocks usable in all locations. What you see in the image above is just a “selection” of everything headed your way. More information on upcoming Hitman 2 content will be announced April 29.